Valve clearance is an important component of a smooth running motorcycle engine. Checking and setting your valve clearances should be a regular part of your motorcycle maintenance routine. If there is too little valve clearance, the valves will never fully seat and will get hot and burn. If there is too much valve clearance, the parts will be slapped around and make a lot of noise, potentially damaging top end internals. Valve adjustments and measurements are made when the engine is completely cold. Unscrew the valve tappet covers of the head cover, depending on your engine’s design. Remove the cover to get to the nut on your crankshaft. Bring the cylinder your are checking to TDC (Top Dead Center). Watch for the “T” mark near the spark advancer. When it lines up to the engine case timing mark you are in the right position. Measure the clearances for the loose tappets. Refer to your shop manual for the exact procedure and the proper clearances for both intake and exhaust valves – they will be different. If you’re not sure where Top Dead Center is for a given cylinder, you can remove the spark plug and stick something long down the hole (do don’t jam anything in there). When the screwdriver/rod reaches the top and then starts to go down, you’ll know where TDC is. For overhead cam motorcycle engines with rocker arms and screw adjusters, place the proper sized feeler gauge between the tip of the valve and the end of the tappet screw. Use a wrench to loosen the locknut and tighten or loosen to the tappet clearance screw if the clearance is out of spec. Retighten the screw and locknut and measure again. Sometimes the screw’s clearance will change when you tighten the locknut. For shim under bucket valves, you’ll need to take the measure between the bucket and the cam lobes. You’ll need to record each measurement as you go along. If it is out of spec, you’ll need to disassemble the camshaft to get to the valve buckets and shims. For the clearances that were out of spec, remove the bucket and check the size of the shim that rests between the bucket and the valve tip. 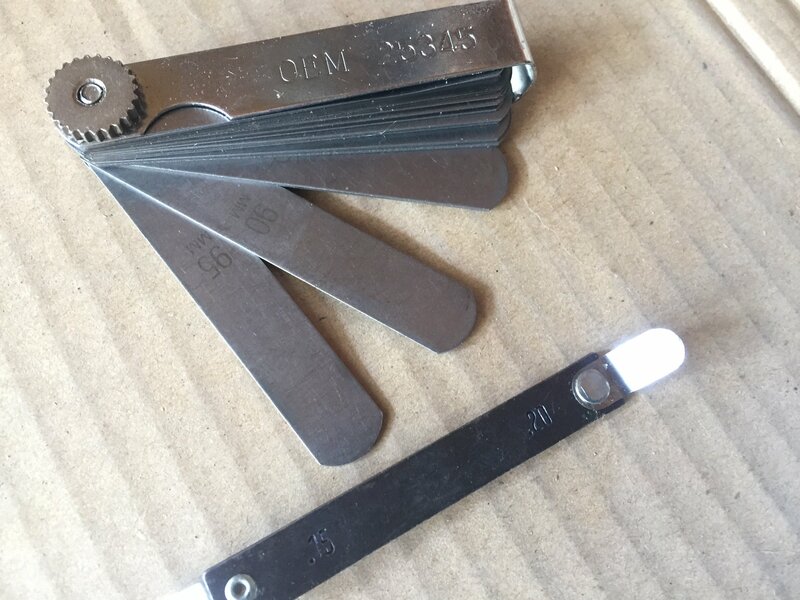 The shim’s size will be stamped on the top, but can wear out overtime. You can confirm its size with digital calipers. Replace it with a new shim that will get you to the proper clearance.